The Windows Store (formerly Phone Marketplace) is still catching up with the Apple App Store and Google Play. The number of apps available crossed the 100,000 mark a while ago and, while that doesn't quite compare to Android and iOS, Microsoft says that most of the top 50 apps are already available for WP8. Apps written specifically for Windows Phone 8 won't work on the older versions but all of the older apps will be compatible with the new WP8. One thing that might be a problem is that not all apps support devices with 512MB RAM like the Lumia 720. At least not initially, many apps eventually do get 512MB support. The Store is divided in three main sections - applications, games and music. Another section called Updates shows up when one of your installed apps has received an update - there's an Update all button, which will save you the hassle of updating each app individually. Anyway, each app will be listed with a short description, a rating and user reviews, a few screenshots and permissions. While the list of permissions isn't as elaborate as it is on Android, the Store will explicitly ask you about the important stuff (e.g. location info). Nokia App Recommendations will help you get the best apps, including a number of Nokia Lumia-exclusives (things like the Nokia Weather Channel, which you might have missed) and categories like Starter pack or Shop 'till you drop. The Music section is actually the Xbox (previously known as Zune) Marketplace. Its structure is similar to the Application section. First, a featured artist of the week, three more featured artists, and then a list of new releases, top albums and genres. The Games section is divided into Xbox Live, New, Featured and Genres. A great thing about games in the Windows Phone Marketplace is the trial option, which is available to many games and apps. You can try before you buy. Search is available in the Store but right now it pulls together search results from all sections - games and apps alike. Microsoft have fixed the issue where songs would get mixed up in the search too, which was annoying. Nokia is bringing their own mapping solutions to the table and they are more powerful than the default Bing Maps that other Windows Phones come with. Nokia recently rebranded their mapping and Sat-Nav solutions as HERE. 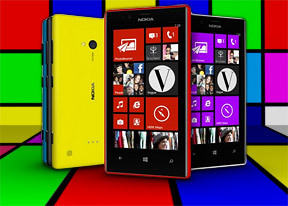 Nokia HERE Drive is the premium app - it offers free, life-time voice-guided navigation. All you have to do is download a voice in your language of choice and you're good to go. Of course, to make use of the key selling point of Drive - offline navigation - you have to download a map for your country. When Nokia rebranded Maps it also split the app into two. HERE Drive that comes free with your Lumia 720 gives you a navigation license for only one country, depending on the SIM card you put in the phone. Drive+ gives you the global coverage, but that only comes on the higher-end models (it will be available for purchase for non-Nokia devices sometime in the future). Anyway, that's one major thing to consider when buying a Nokia Lumia 720 - it can only be used for navigation in your home country, but not abroad. Even if you buy a new SIM when visiting abroad, it will not change the license. With HERE Drive you can easily plan routes (no data connection needed) and you can tweak various settings for each route - fastest/shortest/economical route can be selected and you can choose whether the app will use or avoid motorways, toll roads, ferries, tunnels, unpaved roads and motor trains. There are icons to remind you of the selected settings. We do miss a few options - like setting a starting location other than your current location and downloading maps for an entire continent. Still, Nokia offer quality maps and offline voice-guided navigation out of the box, which puts them ahead of other Windows Phone makers and even other platforms (both Android and iOS require a data connection to plan the route). Nokia HERE Maps takes on other duties - it's more of a replacement for paper maps that you can take as you explore a city. It will help you discover new places, read a quick description, see photos, read reviews and check what trusted guides like TripAdvisor, Lonely Planet, ViaMichelin, Expedia and HRS and more have to say about it. You can switch to a traditional list too - you just hold the phone upright and it will switch automatically (it's triggered by the accelerometer). Or if you hold the phone at a right angle to the ground, it will switch to map view. Tapping on a place will fire up Nokia HERE Maps so you can have a look at the extensive info it offers.